Listen in on our cryptocurrency taxation podcast series talking with accountants, tax attorneys and companies about issues around Bitcoin and crypto taxation. There is some great information on filing your taxes and how the new tax laws might affect you. If you have any suggestions, or would like to be be included in our podcast series, please contact us at . Calculating capital gains/losses for Bitcoin and crypto-currencies isn't always straightforward. Do you know the cost-basis of every coin you own? 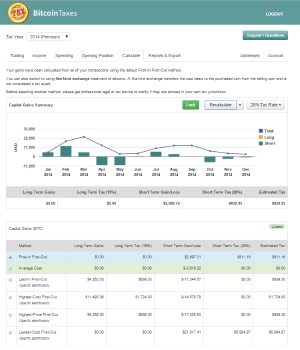 Are you tracking the profits and new basis when you spend or sell? Can you work out the best way to identify your trades to optimize your taxes? BitcoinTaxes have integrated and teamed up with online tax preparations services to help import your crypto activity into your tax forms. This year, get your biggest possible tax refund – without leaving your living room. TurboTax, the #1 best-selling tax software, is up to date on the latest tax laws and guarantees 100% accurate calculations, so you can be confident your taxes are done right. And with TurboTax Live, you can even talk with a CPA or EA onscreen for unlimited advice and a final review of your return. Are you looking for a full tax service? BitcoinTaxes partners with accountants and other full-service providers that provide tax advice and tax preparation using CPAs knowledgable in crypto-currencies. They will work with you to complete and file your taxes, backed with the power of the Bitcoin.Tax system. Simply import details of any crypto-currencies you have bought or sold from one of our supported trading exchanges, add any spending or donations you might have made from your wallets, any mined coins or income you have received, and we'll work your tax position for you. You can compare using different cost-basis methodologies, including FIFO, LIFO, and average costing, as well as comparing like-kind treatment. We'll show your Capital Gains Report detailing every transaction's cost basis, sale proceeds and gain. An Income Report with all the calculated mined values. A Donation Report with cost basis information for gifts and tips. And your Closing Report with your net profit and loss and cost basis going forward. Your Capital Gains are also ready to import directly into tax software, such as TurboTax® and TaxACT®, attach as a statement to your tax return or even print as a PDF. You can visit our new Directory of Bitcoin Tax Professionals to help find crypto-currency knowledgeable tax accountants and attorneys for tax advice, tax planning or other tax services . Calculate tax years for US, Canada, Australia, Germany, United Kingdom or starting on 1st Jan. If you are a tax professional, CPA, or accountant firm, you can use BitcoinTaxes to import and calculate your client capital gains as well as income from mining or crypto-currency payment processors. Our Tax Professional and Tax Firm packages allow your users to enter transactions on behalf of your clients, perform the calculations and then download the appropriate tax information. You'll get all our available features, for an unlimited number of transactions, usable for an unlimited number of clients over each full tax year since Bitcoin started. See the Tax Professionals and Accountants page for more information and to try it out. Took about 10min. Problem solved. You made a worrisome tax season into a manageable affair. The premium service saved me lots by using alternative tax accounting methods. Thanks for your hard work and excellent product!! I'm totally impressed by your system. Thanks again, your support is pretty impressive!